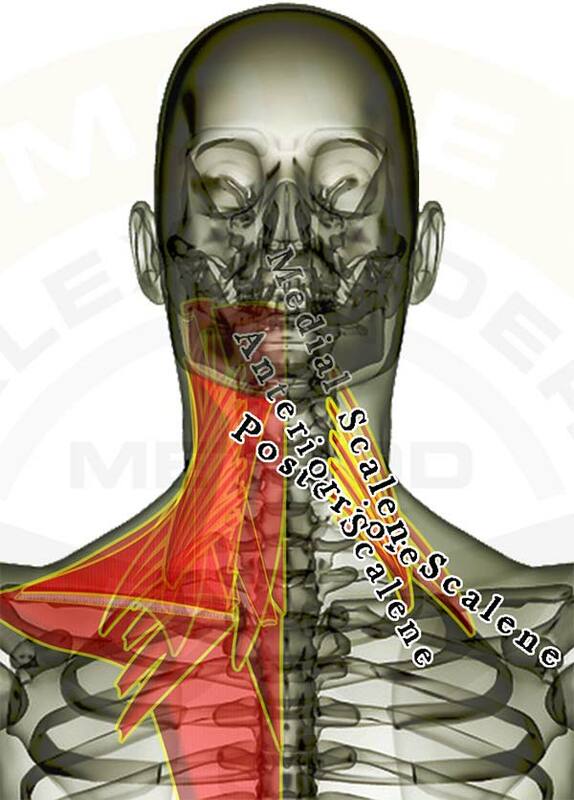 Pictured above are the scalene muscles. They lie underneath the sternocleidomastoid, originate along the front & side of your neck, and attach to the first and second ribs. They have a lot of influence on proper neck posture, and are typically "stress muscles." The image of the muscles is layered, showing how some of the muscles are covered by the others. All of the muscles are see-through so that you can appreciate the location and size of each muscle relative to the others. Pictured above are the muscles in the back of the neck. 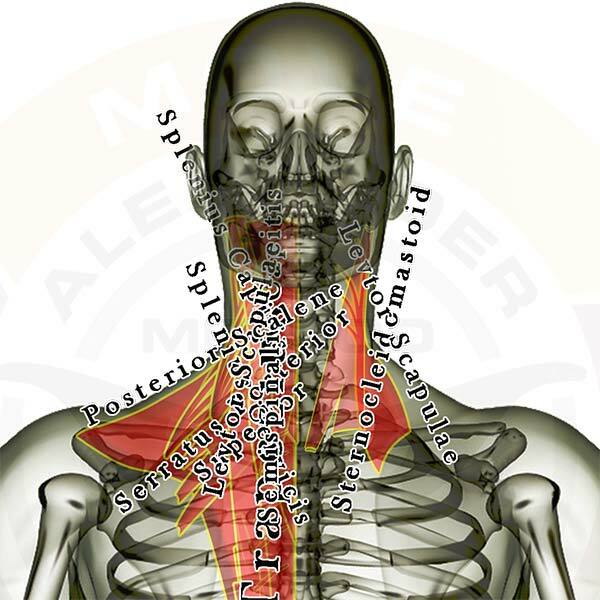 The levator scapulae and sternocleidomastoid are labelled on the right and all of the muscles in the back of the neck are listed on the left. The levator scapulae and sternocleidomastoid are very influential muscles for proper neck posture. Click Here for SMR technique instructions. The muscles are layered, showing how some of the muscles are covered by others. All of the muscles are see-through so that you can appreciate the location and size of each muscle relative to the others. 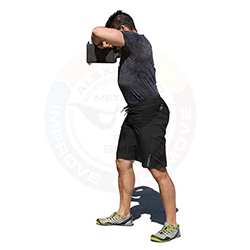 Use this SMR exercise AFTER the Lats Roll and in compliment with the Neck Roll. This SMR exercise is to address the layers of knots & adhesions in the numerous muscles in your neck. If you have tightness or discomfort in your neck, headaches, or general shoulder & neck issues, then this exercise is likely to help. Be sure to post your questions and comments below. We want to provide the best instruction to help you recover from your workouts. Use this SMR exercise AFTER the Lats Roll and the Pecs Hand Press (or one of it's alternatives), and in compliment with the Sterno Roll. Pictured above is the levator scapulae. The levator scapulae is a very influential muscle on proper neck posture. Click Here for SMR technique instructions. Use this SMR exercise as an alternative to the Pecs Hand Press. Use this SMR exercise to address the muscles in the front of your chest (primarily the pectoralis minor). If you have trouble with rotator cuff issues, shoulder impingement, frozen shoulder, or just about any other discomfort in your shoulders or neck, then this exercise is for you! The pectoralis minor muscle is involved in everything you do that involves the shoulder blade. 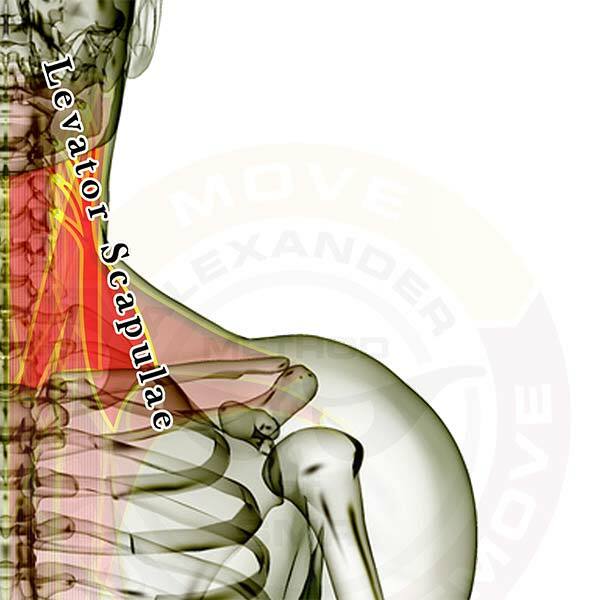 When it locks up, all shoulder movements (and even some neck movements) are compromised. You should do this movement (or the Pecs Hand Press or the Pecs Floor Press) at least once every 2 weeks. (more often is better) One of the three versions of the Pecs Press will make more sense to you than the other two. The one you that you feel the best release with when practicing it is the technique you should utilize at least every other day. Practice all three pecs techniques in rotation over several days along with all of the shoulder techniques (Primary, Secondary, and Extended) when you are attempting to clear a shoulder issue that needs more attention. For written instructions, click here. Click here to see the rest of the SMR Techniques. Use this SMR exercise AFTER you do the Lats Roll and the Pecs Roll (or one of the Pecs Press alternatives). This SMR exercise addresses one of the 16 muscles attached to your shoulder blade, the levator scapulae. If you have trouble with neck pain or shoulder pain when you lift your arm, then this exercise is for you! Keep in mind that the pectoralis minor muscle is involved in everything you do that involves the shoulder blade. You will likely benefit from loosening knots in the levator scapulae, but be sure you stretch out the pec minor or your issue is likely to come right back.